The game space is a cubic room. The back wall is defended by your opponent (the PC) and the front wall (behind you) is defended by you. The aim of the game is to make the ball hit the back wall of the game cube while preventing the ball from hitting the front wall of the game cube. There are three variants of the game: Arcade (continuously increasing skill of your opponent), Match (played according to the classic rules of tennis) and Discovery (a pleasant way of opening beautiful pictures on each wall by making the ball strike them). 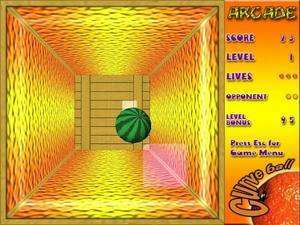 3D Pong CurveBall 1.0 is a shareware program and can be used as a demo to try the software until the free trial period has ended. A full version of the program is available after the trial period ends. For security reasons, you should also check out the 3D Pong CurveBall download at LO4D.com which includes virus and malware tests. Additional screenshots of this application download may be available, too. 3D Pong CurveBall has a presence on social networks.